Suscram Weetslade Route - Suscram. The start of this route is mainly on footpaths and may not be suitable in wet conditions. 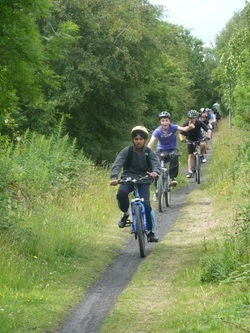 Set off from B-gate and head straight up the cyle track in the direction of the shops. Before the first underpass take the left hand path up onto the road which you can follow to the dead end. Behind the barriers you will see a bridge over the North East main line railway. Pass over the bridge and follow the footpath along the edge of the field. 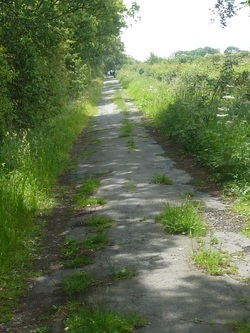 The footpath turns into a track and meets a disused road. Turn left at this junction and folllow the road to where it ends at some large concrete blocks. Follow the road round to the left and look for Plantation Farm. At the moment this looks like a building site, but access through the farm is still possible because it is a public right of way. at the far end of the farm yard you will have to lift your bike over a style. The path crosses a bridge over the A19 and continues, south, through the middle of a field. You will pass High Barnes farm and end up at Dudley Lane. Turn right here and follow the wide cycle path that runs along side the road. Follow this all the way to Astley Community College. Cross the road using the pedestrian crossing and head down the path and the road that cuts through the housing estate. Turn right at the end of the road and aim for the south west corner of the housing estate. A small path, by some old garages, leaves the housing estate and heads towards the B1318. Before you reach the road you will see the Seaton Burn Wagonway sign post showing the direction of Weetslade country park. At the top of Weetslade Colliery pit heap there is a picnic table which us a good place for lunch, although it can be windy! Descend the hill and head east, continuing along the wagonway to Burradon, following the NCN Route 10 signs. As the route crosses the road, the wagon way splits. Your ride continues along the NCN 10 route, but this now follows the route of the Burradon and Holywell wagonway up and over a hill and down under the A19 towards Backworth. Josh stumbles across an old mineshaft at West Holywell and is lost forever! The route turns right when it meets Backworth Lane. Follow the footpath/cycle path to Backworth and pass through the village.There is a Post Office in the village to buy refreshments. Keep going and cross the mineral railway line. You will get to the site of the old pit at West Holywell. Here the road takes a 90 degree turn to the left. On the right a Cattery and a wagonway. Follow the path, which is the route of the Backworth wagonway, past the site of Backworth 'A' pit and goes through a tunnel, under the mineral line. As the track opens up take a right up a small jump and turn right parallel to the mineral line. You will cross this just south of the new bridge that carries the Shiremore by-pass. Across the mineral line. Toddy what are you wearing? Turn left and pass under the bridge then keep right following the newly reconstructed embankment that was the route of the Backworth wagonway ( East Holywell branch). This turns north before it reaches the road and continues in a northerly direction all the way up to Holywell Dene. As you approach the dene there are two tracks very close to each other that head north. The path on the right first descends into the dene and goes across a footbridge. There are some good jumps here! The track on the left continues to follow the route of the wagonway and crosses the dene on an embankment and so avoids any steep ascents. After the church you will cross over the mineral railway and onto a track to Middle Farm. You will pass the old pit heap of Seghill Colliery on your right. Turn right at the junction and head towards the farm buildings. Then bear left on to a track that will lead on to the route of the West Cramlington Waggonway. Look out for the Big Spoon! Follow this under the Spine Road and through Southfield and back to the playground opposite Cramlington Learning Village. If you fancy a diversion to enjoy Seaton Delaval Ice Cream ( as we did ) then after you have crossed Holywell dene, cut through the back streets and the park in Seaton Delaval and savour the delights of our best local ice cream. To continue the route from here follow the A192 until you get to a roundabout. Turn left and follow the B1326 to East Cramlington. After about 200metres this road makes a 90 degree turn to the right. Straight ahead there is a footpath that cuts through the trees and is quite overgrown. Take this path but watch out for nettles and low branches. This path will connect with the route of the Cramlington wagonway. Turn left at this junction and follow the wagonway along the edge of Seghill Colliery pit heap. Turn right at the next junction and you are back on the route described above.